Colin Boyle/Daily Senior Staffer 11 candles are lit in memory of the victims of the mass shooting in Pittsburgh. Colin Boyle/Daily Senior Staffer A man sits at the prayer vigil at Beth Emet Synagogue. 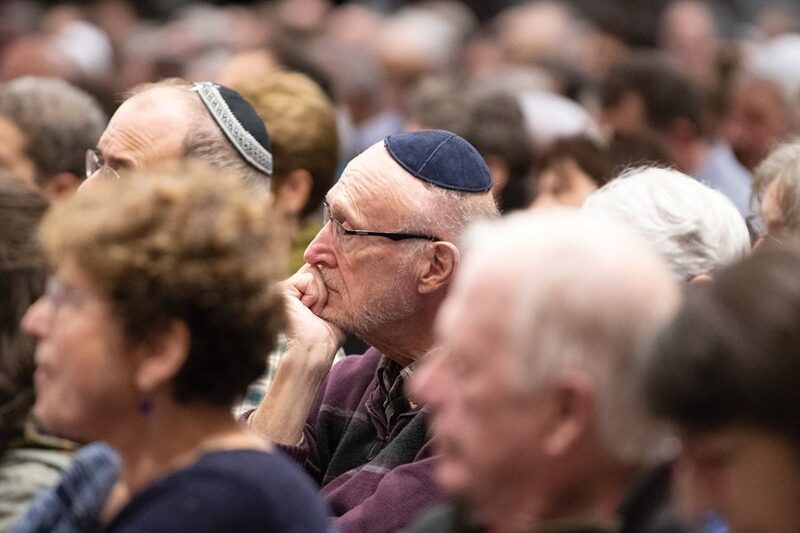 Hundreds of people from different religious and ethnic backgrounds gathered at Beth Emet the Free Synagogue on Sunday night to mourn the 11 killed in the Pittsburgh synagogue mass shooting. Rabbi Andrea London said while she regrets that the community is gathering under unfortunate circumstances, it is important to come together during times of need. “These are not the times we want to gather,” London said. “But sometimes we gather because we know we need to be here. That when they come for any of us, they come for all of us. The shooting at the Tree of Life Synagogue on Saturday morning was one of the deadliest against the Jewish community in the United States, according to The New York Times. The shooter, Robert Bowers, shouted anti-Semitic slurs and shot indiscriminately into the crowd of congregants in the synagogue with an AR-15-style assault rifle and at least 3 handguns. Speakers included leaders of the Jewish, Christian, Muslim and Baha’i communities in Evanston and the service attracted a diverse group of Evanston residents and Northwestern students. At the beginning of the vigil, Evanston Mayor Steve Hagerty asked everyone in the audience who was not Jewish to stand, which amounted to about half of the attendees. Many people at the event, including Hagerty, said they were inspired to see the different people who unified as a collective to support the Evanston Jewish community in a time of tragedy. Dr. Zaher Sahloul, founder of the Syria Faith Initiative, told the audience that he and his entire family were heartbroken after the shooting. Bowers was charged with 29 criminal counts, including obstructing free exercise of religious beliefs, 11 counts of criminal homicide, 6 counts of aggravated assault and 13 counts of ethnic intimidation, according to the Times. 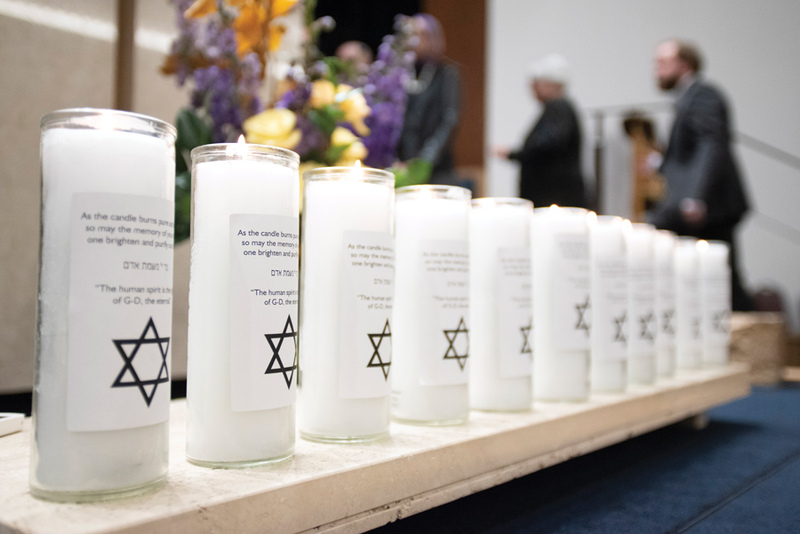 State Sen. Daniel Biss (D-Evanston) did not speak at the event, but lit candles along with other local leaders while Hillel executive director Michael Simon read the names of those killed in the hate crime. Biss told The Daily that it was comforting to see that people were able to come together after Saturday’s tragedy in a spirit of unity, resolve, and commitment to a better world, as opposed to despair. Susan Bearman, an Evanston resident, has two sons away in college and a daughter working away from home. She said she felt afraid after the shooting and needed community with others.